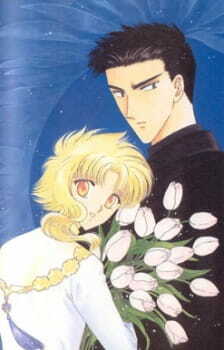 The third of four animated CLAMP music videos, the others being Clover and CLAMP in Wonderland. This one is based on the manga "Wish." "Wish" is about 28-year-old Shuichiro Kudo, a doctor who stumbles across Kohaku, one of God's angels. When he inadvertently saves her life from one of the devil's servants, Kohaku decides to grant him a wish to repay him for his kindness. However, upon discovering that Shuichiro has no wish, Kohaku devotes herself to him, vowing to serve him until he has a wish that she can grant. However, both discover that there are some wishes that can't be granted by oneself. well, like the manga, this music video is 90% cuteness. The manga is rather short, so there is no real need for an anime adaption. You see your characters come to live for just a few minutes and that's enough. You can see the playful nature of the 2 neko 'Ruri and Hari', Kouryuu bullying Kohaku and their transformation by night and day. This is an AMV from CLAMP which is an adaptation of the manga wish. I felt like somewhat this AMV contained what could have been the opening and ending for an real anime adaptation because it had somewhat two songs within. Being a CLAMP AMV this video offers some glimpses at characters and hints of the manga's narrative and theme. Sadly there isnt much to go on in terms of exposition really, but the art and music are well-done. The OP segment was a nice song and the visual accompaniment was well done, wasn't as big of a fan of the ED song but nonetheless as a whole it was a cute little AMV of CLAMP's manga. For fans of the manga or Kohaku in general, fans should definitely look at 'Kobato' where the character is a recurring supporting player in that TV series.